Probability is the study of what will “probably” happen based upon a mathematical perception of “chance”. For this lesson, we will be doing some foundational thinking using independent events to compare and contrast theoretical and experimental probability. Students will be able to find the theoretical probability of an event and then test it against an example of experimental probability. Students will be able to understand that the theoretical probability predictions should be closer to the actual experimental probability results as the number of trials increases. How many flips of the coin do you think it will take before we have a winner? Does Student #1 have an equal chance of winning as Student #2? Can any of you summarize Student #1’s chance of winning? Student #2? Tally their data in a table such as this. Keep this table visible when doing steps 3 and 4 (to compare and contrast). Bring up a second partnership to flip coins. Inform them that the first student to get 10 of their side (heads or tails) will be the winner. Ask the same questions used before. Tally their data in a table just like you did with Step 2. Why did it not take exactly 9 coin tosses to get a winner in our first battle? Why did it not take exactly 19 coin tosses to get a winner in our second battle? If I flipped a head the first time, does that mean that I will always flip a tail the next time? Am I more likely to flip a head if I just flipped a head? What was my probability of flipping a head each coin toss? What was my probability of flipping a tail each coin toss? Bring up two more volunteers. This time bring out a die (singular of dice). Do “rock, paper, scissors” to decide who gets to be the student that gets the factors of 6 and who gets to be the student that gets the non-factors of 6. They will have very different probability. Whenever one of their numbers is rolled, they get a tally mark. The winner has 10 tally marks. How many rolls of the die do you think it will take before we have a winner? Tally their data in a table such as this. Discuss this die rolling example. Were we close in our prediction of how many rolls we thought it would take? 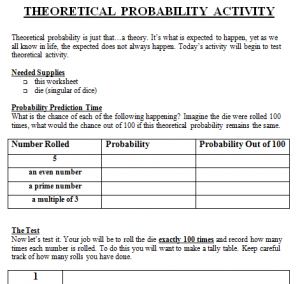 Hand out the Theoretical Probability Worksheet and a die (singular of dice) to each student. Explain the worksheet to the students. Here’s an image of part of the worksheet. 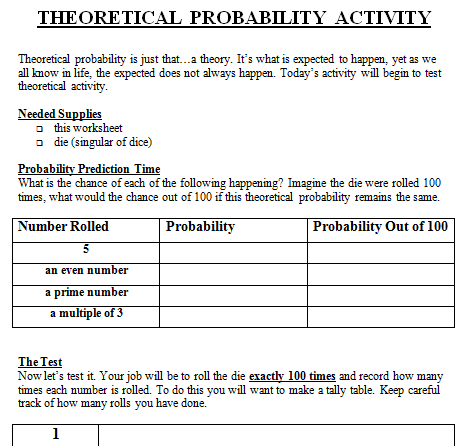 Fill in the “Probability Prediction Time” section with the students. Teach the students how to tally in groups of 5 (this will be new to some). The biggest challenge in this activity is having students roll the dice exactly 100 times. You may want to put them into partnerships instead. In this case, one student keeps track of the number of rolls while the other student tallies his/her results. Then switch so that each student has his/her own unique data. If you are not using partners, really stress to the students that they will want to organize their total number of rolls somehow (either through tallying on their own) or stopping to count their progress regularly throughout. Each student needs exactly 100 rolls for this to be highly successful. Have the students complete “The Test” section of the worksheet. Note: This will get loud as students roll. I usually give about 5-10 minutes for the actual 100 rolls and tallying time. If you are using partners to help with counting the rolls, then double the time needed. As a class, complete the “Comparing Theory with Reality” section of the worksheet. Students may need help turning their fractions into percents for the “Probability Out of 100” column. You may opt to let them use calculators. Have students independently answer the “Critical Thinking” questions. As a good follow up, you can choose one of the categories (i.e. multiples of 3) and come up with a class total for this to show that the greater the number of trials, the closer the experimental probability results come to the theoretical probability predictions. To do this, you would find the sum of all multiples of 3 (as an example) for the class. You can do this more efficiently by collecting class table sums. Then take this sum and divide it by 100 times the number of students in this class (the total number of rolls for the class). This will give you a decimal number that you can convert to a percent. It should be fairly close to the theoretical probability predicted percent. If time allows, you can do this with the other categories to see how close your class was as a whole for each theoretical probability prediction.